Thirteen years after winning her first international gold, Anastasiya Prokopenko of Belarus enjoyed the crowning glory of her career as she became world champion for the first time. 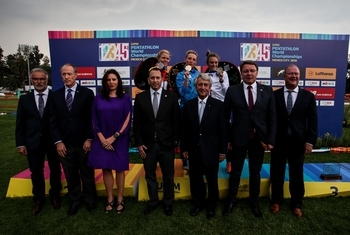 She has had a glittering career, but until now victory in the Women’s Individual Final at the UIPM Pentathlon World Championships had eluded Prokopenko (BLR), who turns 33 next week and has two children. Last year she won her first individual medal, a bronze, and this time nobody was going to come between her and the top of the podium. At the start of the Laser Run, there were 11 rivals doing just that. It was no surprise to see her starting 60sec behind the leader, Marie Oteiza of France, and no surprise to see her slicing through the pack with her dynamic running and shooting. 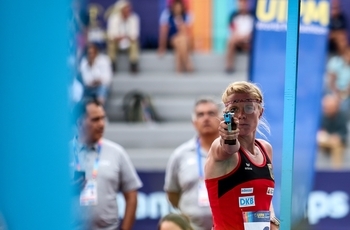 On the third lap, it looked like Annika Schleu of Germany was the one destined to win pentathlon’s most coveted annual prize. She overtook the leading duo, European champion Oteiza (FRA) and 2016 world champion Sarolta Kovacs of Hungary, with such effortless grace that it looked like her world title to lose. But that is exactly what happened: Schleu (GER) froze at the final visit to the range, taking 26sec to record her five shots, and Prokopenko (BLR) did what she does best and raced into the lead after a 9sec shoot. Schleu (GER) kept her head to win silver, her finest achievement to date, while Oteiza (FRA) confirmed her exciting potential by confidently hanging on to bronze. Zsofia Foldhazi and Kovacs finished 4th and 6th respectively for Hungary, while Uliana Batashova of Russia was 5th and Janine Kohlmann (GER) completed an all-European top seven. 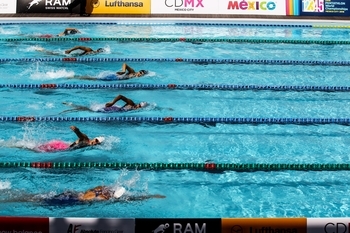 To the delight of the home crowd, Mayan Oliver of Mexico finished 8th. She will turn 33 next week, but now Prokopenko (BLR) looks more than ever like a contender for the biggest prize in the sport when the Olympic Games take place in Tokyo in 2020. She won her first gold in the UIPM Pentathlon World Cup way back in 2005, and twice she has finished in the top six at the Olympic Games. In 2017 she announced her return to the top with a gold medal at the European Championships and a bronze at the World Championships. 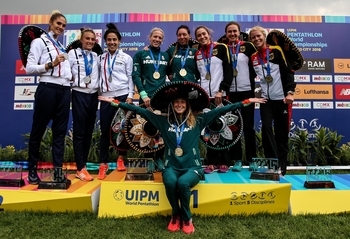 In Mexico City, she had already scaled the top of the podium once, winning Women’s Relay gold on the opening day with Belarus team-mate Iryna Prasiantsova. After becoming the first person to win an individual world title in a Pentathlon Stadium, where all five disciplines take place in one venue, Prokopenko (BLR) said: “It’s a good job, because in my heart I believed it but, looking at my starting number, I didn’t believe it. “It’s fantastic. My shooting was fantastic and my running was very, very fast … and I believed it. I believed it. It’s life! “I didn’t see Annika, I only looked at my target and my shooting, and when I left the range I thought ‘what? I’m first? No! Schleu (GER) said: “I was wondering about myself because it didn’t feel like the World Championships, I was just running and I wasn’t feeling nervous, but then I tried to focus and then somehow I made a few mistakes in the last shoot. “Actually it’s not because I was thinking about the title, I just made some mistakes and, OK, it became silver. I want to say to Lena [Schoeneborn], we tried to do something good after your retirement. Oteiza (FRA) added: “When I ran I was just focused on myself, I didn’t think about the other girls. I didn’t see anything or anyone, it was just me and my shoot and my run. The reigning champion, Gulnaz Gubaydullina (RUS), set the pace in the pool with a time of 2:08.71, just over 1sec faster than 2016 champion Kovacs (HUN). Misaki Uchida of Japan timed 2:11.01. Oteiza (FRA) became European champion this summer and she proved her Fencing ability once again with an outstanding display, resulting in 25V/10D in the Ranking Round and two points in the Bonus Round. Kovacs (HUN) was not far behind with 24V/11D, while Batashova (RUS) also put herself in a strong position. Prokopenko (BLR) also had a good day on the piste, scoring 21V/14D – the same as Schleu (GER) – and adding four bonus points. Establishing herself as the athlete to catch, Oteiza (FRA) held her nerve on horseback too as she became one of four women to enjoy a clear round and a maximum score of 300. The others were Zhang Mingyu of China, who recently won gold at the Asian Games in Jakarta (INA), Kate French of Great Britain and Francesca Tognetti of Italy, while Kovacs (HUN) and Schleu (GER) did little to harm their gold-medal prospects with a score of 293. The title defence of Gubaydullina (RUS) was effectively over as she conceded 64 penalty points, while Alessandra Frezza (ITA) was eliminated and Samantha Achterberg of United States failed to finish. 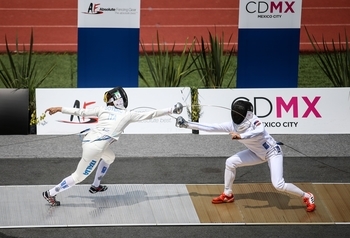 Overall, the standard was very high and everything was set for a grandstand finish in Mexico City’s stunning Pentathlon Stadium. It looked like it could be a two-horse race, with Oteiza (FRA) and Kovacs (HUN) way out in front, but seasoned observers knew there were Laser Run specialists in the chasing pack waiting to pounce. Kovacs (HUN) put pressure on the leader during the first two laps, but Schleu (GER) was making serious inroads into her own deficit and after a slick shoot at the third visit to the range, she eased past Oteiza (FRA) to assume the gold-medal position. It is unlikely that she would have seen Prokopenko (BLR) move with typical urgency up from 12th to 3rd, but Schleu (GER) may have noticed a flash of red behind her back during her struggles on the final shoot. It was the decisive moment of the day, and a classic stealth operation by an experienced three-time Olympian, resulting in a long-awaited and deserved moment of glory. Unusually, one athlete completed the course even more quickly than Prokopenko (BLR) and that was Anastasiia Vasileva (RUS), who timed 12:05.99. UIPM President Dr Klaus Schormann said: “We had a great Women’s Final today, with such an exciting competition at the highest level. I would say it was like Olympic Games level, and in the end during the Laser Run we saw how the places changed. “Our athletes never give up, no matter how far behind they are. We also had great performances in the Riding today, and the whole competition was a great showcase for our movement and congratulations to all the women on the places they got. 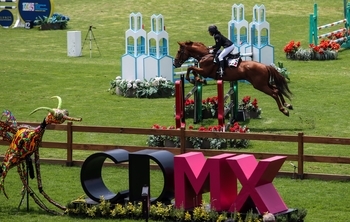 Horacio de la Vega, two-time Olympic pentathlete, President of the Local Organising Committee and Sports Director for the Mexico City Mayor’s office, added: “I think it was a great day, the weather helped us and I’m very grateful for that. We saw great results for the Belarus, for the Germans and the French and the Hungarians, and I’m very happy that we had the best-ever result in the competition for a woman athlete: Mayan Oliver. The UIPM 2018 Pentathlon World Championships conclude on September 13 with the Men’s Individual Final and the Laser Run will again be televised by a record number of international broadcasters; check here to find out how to watch the action in your country. A live stream of the finals will also be available on UIPM TV and up-to-date results of all competitions are available at the UIPM website. Don’t forget to tune in to UIPM’s social media activity on Facebook, Twitter and Instagram.